Namco Bandai handed me a long list of things I couldn’t tell you about my hands-on with Enslaved: Odyssey to the West, but the funny thing is I’ve got an even longer list of things I don’t want to tell you because they’re so damn awesome. 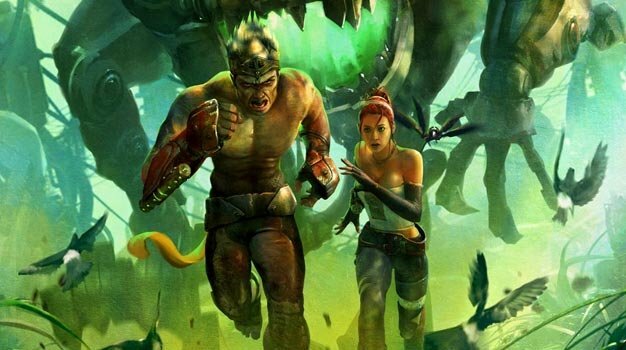 Enslaved is the latest title from Ninja Theory, the guys behind the high-profile PS3 exclusive Heavenly Sword. If you didn’t already know that though you could probably have guessed; the art style is strikingly similar, and there are several references to the team’s last game through characters models etc. The similarities end there however, because past that Enslaved is an entirely different beast; sure there’s a hefty amount of fist-smashing, stick thumping action to take part in, but there’s also a big focus on platforming and puzzle solving that make this a promising title. The first chapter of the game does a great job of introducing us to both the characters and the key gameplay components. As we start up, Monkey knows as little about what’s going on as the player does; he’s being held being held captive aboard a slave ship, not knowing where he’s headed. It’s not long before he’s free however, and that’s when the game hands it over to us. Straight away –and I really do mean straight away – it’s clear that Ninja Theory took a heck of a lot of inspiration from the Uncharted series; the set pieces, explosions, and platforming all reek of Nathan Drake’s adventures, only (whisper it) on a bigger scale. Monkey can pull off the same exaggerated leaps and bounds as Drake but his muscular form makes it slightly more believable. The scenery he scales isn’t as organic as everything you can jump/grab onto is highlighted, but that makes for a more fast paced system that sees Monkey swiftly jump from place to place. We also get our first look at the combat, which proves to be fun and satisfying. Monkey has a standard mash of heavy and light attacks to beat down his robotic foes with, but there are a few other bits and pieces to mix it up, like a charge attack that stuns enemies who are blocking most of your hits. The majority of the combat goes through your fists and Monkey’s own weapon, a lightsaber-style staff that dishes out a good amount of damage. Admittedly we had a little trouble warming to the fighting at first; it can get quite hectic when there’s more than one enemy, especially when you’re fighting in a tight area, but the game does give you the tools to combat this like area attacks. It shows that you’re not going to simply be able to button mash your way through Enslaved, as this approach got us pretty dead pretty fast early on. There’s also a fair few in-game cut-scenes to see, especially as the chapter comes to a close. These really do look like they’re going to be a high point of the game. Monkey and Trip start their journey on a rocky road that instantly creates a unique chemistry between the two. The voice acting for both characters is spot on, but it’s the facial animations that really stand out here. From the wide-eyed aggression of Monkey’s sarcasm to the cold, concerned stare of Trip, you’ve never seen such detail in a game before, and it goes a long way to telling you about the characters and their emotions without them even speaking. In fact the whole game carries a similar level of detail; while Trip and Monkey bicker we can’t help but gawk at the incredible scenery surrounding them. If the apocalypse leaves the land looking this good, then we’ll lay back in our freeze chamber and sit the next millennium out. By the time Trip and Monkey meet you’re already totally sucked into a story that’s pulled a surprising amount of twists and turns this early on in the game. Plus with Trip now by our side we have a real objective; get her home. If she dies then so does Monkey, meaning he’s pretty much forced into trekking 300 miles to get her back where she belongs. It’s safe to say this relationship hasn’t exactly got off on the right foot, but we see a great deal of character development throughout our time that assures us the story will stay fresh and exciting. So we’ve had our dramatic opening, we know the ropes and we’ve met the characters; it’s time for Enslaved to really begin. It turns out that the game is very much a problem solver of a title; once you’ve caught a dragon fly that acts as a spy camera, every area you come to will be scanned for threats and solutions, and then you’re left to take care of the rest. A clever heads up display lets Monkey see everything in his path, and Trip and a few tricks of her own to help you out. At first this had us a little concerned about finding your own way; the game leads you down a very specific path with little room for experimentation. However once you get past the first few areas it does open up a bit, letting you sneak by enemies instead of heading straight into combat. Plus a variety of enemies and obstacles keep things mixed; you’ll have to find routes around ranged attacks before they finish you off, and you can take control of sentry turrets to mow down approaching threats. Monkey even has his own ranged attack; his staff shoots beams that can either harm or stun an enemy. Once you’ve learned the vast majority of the moves you’ll realise that Enslaved follows a very rock, paper, scissors style of gameplay; you’ll go from area to area, analyse a threat and instantly know if you need to attack, sneak past, or take control of whatever’s in your way. We’re a little bit concerned that this formula could get old fast, even with new gameplay mechanics appearing every once in a while. We haven’t forgotten that repetition was a glaring flaw of Heavenly Sword, have Ninja Theory? Still, there’s signs that the gameplay will evolve; Monkey is able to upgrade his attacks and kit, and soon enough the game is confident enough in your abilities to throw several challenges your way at once. 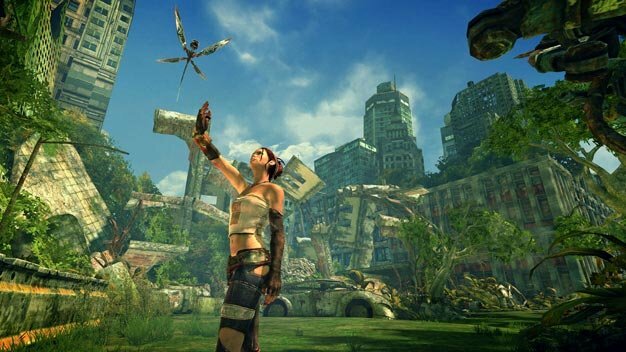 Add this to a set of devious puzzles and we’re hopeful that Enslaved will overcome our early woes. 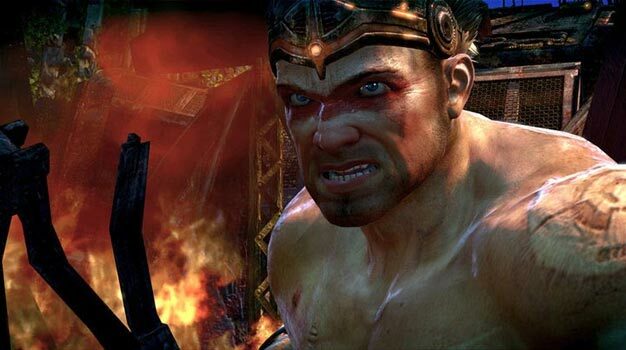 We almost had to be torn away from Enslaved (when we finally put the controller down, the office lights were out and everyone else was ready to go) because our time with it really was so compelling. Not many games manage to look this good, play this well, and hold an intriguing story too; Enslaved could be a perfect mix. It’s a good thing then that we won’t have to wait long for the game’s early October release date.